Location: Acton Burnell, Shropshire, England. Notes: Acton Burnell Castle is a 13th-century fortified manor house, located near the village of Acton Burnell, Shropshire, England (grid reference SJ534019). It is believed that the first Parliament of England at which the Commons were fully represented was held here in 1283. Today all that remains is the outer shell of the manor house and the gable ends of the barn. It is a Grade I listed building of the Statutory List of Buildings of Special Architectural or Historic Interest. 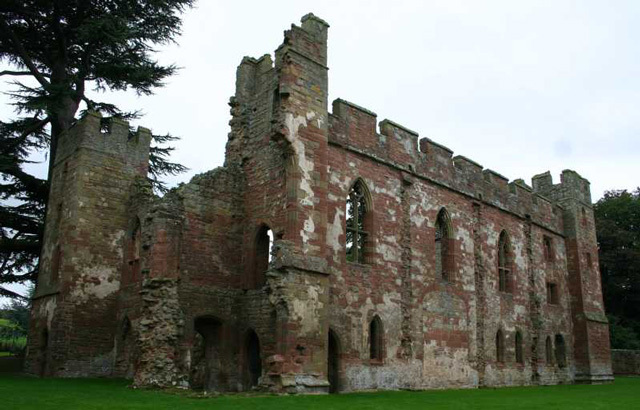 Today Acton Burnell Castle is maintained by English Heritage. All that remains open to the public is the shell of the former private residence, accessible via a footpath through a small wood.